Synaptics is finally starting to emerge from their shell, and are talking about the spiffy new UI technologies they have to offer. If you thought they stopped at touchpads, you have a lot to see. We have no idea why Synaptics suddenly decided to talk to the press, it could be anything, but at Computex, they were making up for lost time. There were three interesting things they were showing off, a near field communications (NFC) reader, active styluses, and their integrated controller. First up is probably the most interesting, it is a touchpad with an NFC reader built in. It can read cards/tags while the touchpad is being used, and of course it is a Synaptics touchpad, so no worries on that front. If you have never looked in to the tech behind a touchpad, there are a lot of layers and most of them are hugely sensitive. A minute change can mean the difference between one that works well, and one that, err, you have probably cursed at that kind here and there. The picture above is the bottom of a demo reader, obviously not optimized for size. NFC tags are read from the copper plate that is under the touchpad. This one should allow for NFC reading while being best in class for the main job, a multi-touch pad. In Synaptics case, it will read more points than you have fingers, and that is only because they didn’t bother with the code for more. If you have a novel 10-finger plus tongue input scheme, the hardware is already in place. If you have been seeing Intel’s promise of integrating NFC into Ultrabooks, this is how they are going to do it. That said, in Intel’s case, it is based on an insecure foundation, with an insecurable OS mandated on top. The author wouldn’t read an enemy’s card with that setup, but has no worries about the Synaptics portion. That said, educate yourself about NFC before you jump in, the current implementations AFTER THE READER are about as secure as rice paper walls on a maximum security prison. In the rain. 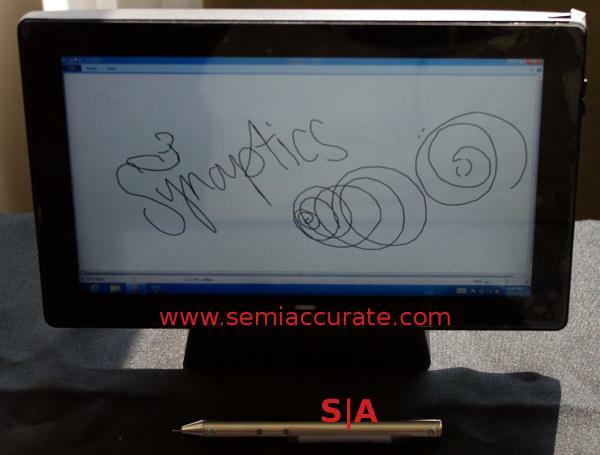 Moving on to the next thing Synaptics was showing off, you have the above tablet with an active stylus/pen. It is active because it takes power and also will read proximity to the screen. This is mandatory for a lot of the annoying spiffy effects you get with Windows 8, basically hover and pressure effects, you need an active pen. Synaptics has that tech to offer, and as we saw at Computex, it works quite well on Win8. Since that is about all the good we can say about Win8, we will leave it there. The last part is a before and after, basically the old way vs the Synaptics way. It also explains why OEMs and ODMs like Synaptics, quite simply they save money and space. In the world of tablets, phones, and other space constrained devices, every square mm is worth a lot, and being a little bigger than the next bidder can make or break a deal. Similarly, the more parts you need, more wires, and more assembly time you take, the less you are worth. As you can see above, the blue PCB is from a device that did not use Synaptics, and Synaptics version has a green PCB. Both do the same thing, but the green one is much larger than it needs to be because it is a retrofit to an existing design. Parts count, assembly time, and PCB space could be dropped dramatically with the more integrated synaptics controller. While the controller itself may be more expensive, or not, depending on many factors, your device will be smaller, thinner, and cheaper as a result. Guess which board above costs less, even if the controller itself is a few pennies more?